Well, I started my Monday off really well with a Starbuck's and pumpkin bread and that got me going to do a little cleaning up and cleaning out (my underwear drawer--you know you need to do the same, so don't judge). Am I getting a little bit of spring fever? Yes, I think I am. I'm so ready for the weather to be nice to enjoy the park more frequently and open the windows of the house and get some spring cleaning (out) done. So when I was forming my idea for today's TCP Tuesday Challenge from The Cat's Pajamas, "The Great Outdoors" came to mind. That's right, I'm your Hipster Hostess with the Mostess this week and as always, I bring a swanky Stamp and CutUps Die Challenge. This week's challenge is to use any stamps from The Cat's Pajamas that are out getting a "breath of fresh air" (aka doing something outside) along WITH the Cloud Border CutUps Die. 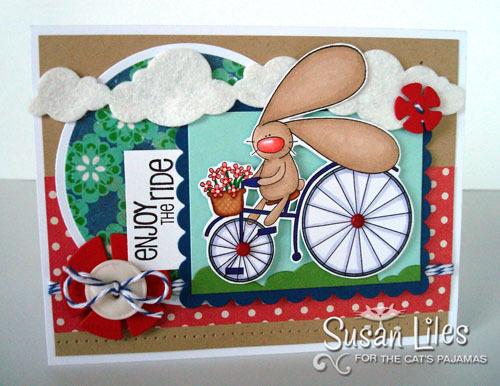 For my card, I used the cute bunny enjoying a bike ride called Wheel Love, but used a sentiment from another set, Joyride that I love. I made the flowers from the Flower Buttons CutUps and I cut the clouds from the Cloud Border CutUps die out of white felt and used it again for the "grass" on my main image panel. I just cut the clouds from green and used my trimmer to cut them in half down the middle. Makes a cute, hilly ground, don'tcha think? Anyway, I hope ya'll get the chance to play along with us this week. I'll be looking out for ya'll's creations! Come chat with me on SCS in the TCPTUES199 Challenge thread HERE. Meanwhile, Alma has all the details on how to play fair and square, and what's at stake when you decide to take the challenge (fame and fortune) on her blog HERE. Then every day, you won't want to miss the other Cat Packers she'll list on her blog for extra inspiration on what The Great Outdoors means to my fellow kitties. MEEEEOOOWwwW! 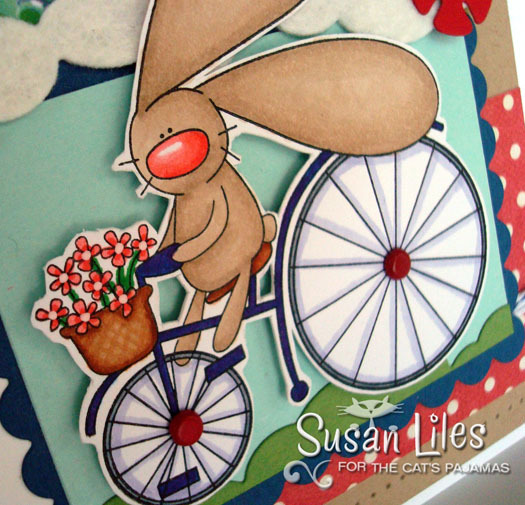 SUSIE Q-TIP: Use brads for the centers of any wheels or tires. It's an easy way to add dimension. 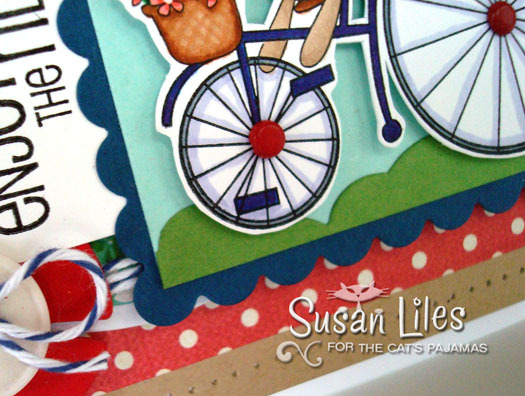 Love your card so many fab details and love the color scheme!